Megan and I can count on seeing a pearl crescent (Phyciodes tharo) in just about every hike we go on, including the weedy field in Kenney Park. I've always noticed the greenish metallicness on this species' thorax, and I was trying to focus on that in this image. This weekend I finally got to do some serious macro shooting with my Canon 60mm EFS macro lens. Since I'm shooting with early morning natural light, I had the lens set wide open to F 2.8, set my focus to 1:1 magnification, and slowly creeped my head amongst the fescue and in towards the insect until just the head and thorax were in sharp focus. I need to do this more often. Yes, it takes some time and can be tedious, but it is really fun. What a lens the canon 60mm macro is. Tom: What a beautiful capture, the butterflies I see are always moving so fast. It is amazing when you get a close-up like this one. Glad you liked the Stow parade pictures. Beautiful butterfly! the first thing I noticed was that "green " stuff on the butterfly! cool! I wondered what it was ! We went to the Stow parade, and had memories of when you would lead the band with your trombone! Miss those days and you being here at the parade. The alumni band played and there was a trombone who graduated with you, leading the pack, but I couldn't figure out who it was. It was the 50th anniversay of the fire dept. and they had more fire trucks than ever leading the parade! I can see that you are going to be a macro master in no time with the new lens. Beautiful shot! Great shot of the crescent. 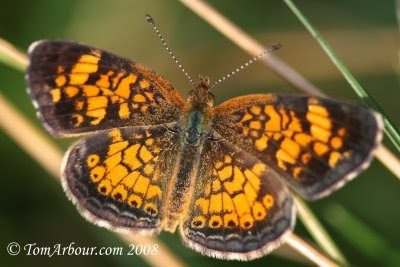 :) I've always thought of crescents as orange-and-black till I got this shot of a Pearl Crescent. I love my macro lens, and don't regret spending the oodles of money on it (as much as the camera body! eep!). It's amazing what you can see with a macro when you get up close! Thanks Tom. Yeah, the Stow Parade pictures brought me back home. Mom- Yeah, FIshing Guy is from Kent and he went to the parade as well, he has pictures posted on his blog. Seabrooke- The lens creates the image, the camera only records it. That is the bottom line. I've become spoiled after using some of the sharper lenses that Canon makes. Nice! Butterflies are hard to capture.